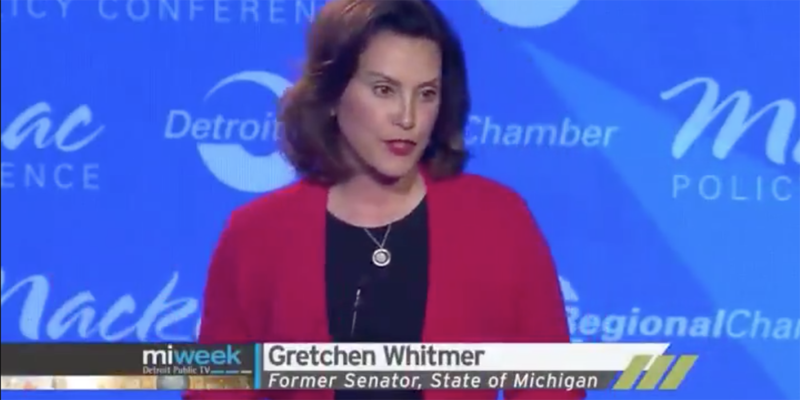 Democratic candidate for Michigan governor Gretchen Whitmer talks about teachers on food stamps, but wasn’t able to locate any when Truth Squad asked. Correction: The original version of this Truth Squad criticized Gretchen Whitmer’s campaign for not producing proof of her claim that there are Michigan teachers (plural) on food stamps. In fact, Truth Squad’s inquiry only asked the campaign to identify “a teacher” on food stamps. Truth Squad separately reached out to the MEA, which identified the teacher in this article. The MEA contends others also likely qualify but did not apply for assistance. This clarification does not change our rating of Whitmer’s campaign claim as Half Accurate. We rate her claim half accurate. “The pillars of a great education require a great teacher in the classroom,” Whitmer said at the debate. “We have teachers in Michigan who are on food stamps. I want you to think about that for a minute.” Whitmer also linked to a clip of this debate line in a tweet. Whitmer’s assertion about teachers on food stamps has been a frequent talking point of the Michigan Education Association, the state’s largest teachers union, which has endorsed Whitmer. Her claim also comes as teachers in other states are becoming more aggressive on funding issues, including teachers who walked out in West Virginia over pay and health insurance and in Oklahoma over pay and state funding for education. Her remarks on food stamps suggest that at least a segment of the Michigan teaching profession is not paid a living wage. Compared with the rest of the nation, Michigan teachers fare relatively well. Public school teacher salaries averaged $62,200 in 2016-17 in Michigan, 11th highest in the nation and more than $3,000 above the U.S. average teacher salary of $58,950, according to the National Center for Education Statistics. And Michigan far outpaces the bottom wage states, which had pay averages in the mid-$40,000s. The Mackinac Center, a Midland-based free-market think tank, argues that Michigan teacher salaries are actually tops in the nation when the state’s cost of living is factored in. Michigan’s standing, though, obscures years of cuts and wage freezes as the state has struggled through financial hardship. In 1999-2000, teacher pay in the state was the nation’s fourth highest, averaging $70,298, adjusted for inflation – making today’s wages a decline of 11.5 percent. In 2011, Detroit teachers were forced to accept a 10-percent cut and pay more for healthcare as the city limped toward bankruptcy. More recently, the state Legislature cut retirement benefits for new teachers. Macomb County teacher salaries averaged $71,936 in 2016-17, the highest countywide average. Schools in Montmorency County, in the northeast Lower Peninsula, had the lowest average salary at $41,967. Walled Lake Consolidated Schools in Oakland County topped individual districts with an average salary of $81,592, with three teachers making more than $100,000 a year. For new Michigan teachers, pay is far lower. According to the National Educational Association, the average salary for first-year teachers in Michigan in 2016-17 was $36,234. At the low end of the teacher salary scale, first-year teachers typically make over $33,000. Starting salaries in the financially troubled Benton Harbor Area Schools fell to less than $29,000 in 2015-16 when teachers took a 10 percent pay cut. But they were restored to $34,000 for 2016-17 for teachers with a BA degree. Truth Squad reached out to the Whitmer campaign and the MEA to locate a teacher on food stamps. Despite Whitmer’s debate line about teachers on food stamps, campaign spokesman Zack Pohl was unable to immediately put Truth Squad in touch with such a teacher. Pohl did point Truth Squad to a teacher in Grand Rapids, but she turned out to have been a part-time charter school teacher four years ago when her family needed public assistance. After several days, the MEA connected Truth Squad with a teacher outside Kalamazoo who said her family – a husband and five children – has been on food stamps for three years. As sole provider, the woman had gross earnings of about $33,000 in 2017-18 as a first-year teacher. She asked not to be identified because she has children in the district. She shared a photo of her Bridge Card – used to redeem food stamp credits – and her employment letter with Truth Squad. An MEA spokesman said there are other teachers who qualify for food stamps but decline to apply for public assistance. Federal standards for food stamps dictate that to receive help you can earn no more than 130 percent of the poverty level in gross income. In addition, recipients can have no more than $2,250 in the bank. For a household of seven, the income limit is $48,288 a year. The Kalamazoo-area teacher’s household easily qualifies. “We pretty much live paycheck to paycheck,” the teacher said, adding they have very little savings. Federal guidelines dictate a teacher in a household of five could earn up to $37,416 to qualify for food stamps. That’s above starting salary in many districts. It’s unknown how many such households there are among teachers in Michigan school districts. There are plenty of worthy arguments for paying school teachers higher salaries, particularly in schools with high poverty and students who have greater obstacles to learning. Teachers in Michigan, and around the country, also increasingly have to do more with less, spending hundreds of dollars of their own money each year on classroom supplies, often as other job benefits are trimmed back. Teaching is hard and important work, and certainly worthy of adequate pay and benefits. It’s also true that starting teacher salaries in Michigan are modest compared with many college-educated professionals, such as marketing or computer information managers, and some skilled-trades. A starting teacher who is sole provider for a household with several children could indeed struggle to make ends meet. But Whitmer’s rhetoric about teachers on food stamps, while apparently true, misleadingly suggests a profession in which poverty-level pay is common. At the debate and in social media posts, Whitmer declares that Michigan has teachers (plural) on food stamps. Her campaign did not identify such a teacher. The MEA helped Truth Squad locate the teacher near Kalamazoo. There are likely others. Nonetheless, Whitmer’s rhetoric is misleading in that it leaves out significant facts about the state’s overall level of teacher pay, relative to other states. We rate her statement Half accurate. Under the Bridge criteria one can say anything and rate as half accurate. No matter what is claimed with enough time and searching you'll find some unusual circumstance that can make any crazy statement true, IN THAT SINGLE CASE! But then you take this and call it half accurate? A more accurate rating would be 99% false! This leaves one to wonder if Bridge's dominant political position influences their ratings? Embarrassing! Chuck, The point is not what teachers earn in raw terms or relative terms. Nor is it what they're worth or how hard they work or don't. Some are and some aren't. The point is that we have a politician feeding this grievance party by gross exaggeration and evidently wanting to base some significant policy solutions on rare cases or situations in order to curry favor with a powerful interest group. Kudos to Bridge for challenging all assertions made by candidates for public office. Hopefully, this practice will make all of them be more careful with their claims and utterances. Everything they say should be scrutinized by fact-checkers so we, the voters, can tell who the political prevaricators are and prevent them from being in a position to govern us with falsehoods. It's rich to me that Steve Cook, past president of the MEA earned $346,391 last year. A large component of that salary was juiced through the added position of "Digital Strategist" which is a newly created. There is nothing on the MEA website which describes the job duties of this position. I'm wondering if the rank and file MEA members are pleased with his performance as a Digital Strategist, it's worth noting that this added $78,000 bump in salary will also count towards a substantial elevation of his pension benefit. The motto of the MEA leadership should be: I'll get mine while I can, keep paying those dues! PS: the whole shop floor mentality of the rigid "step and lane" compensation structure serves as an anchor to the best and brightest teachers. Contrary to the MEA motto that all teachers are created equal, some are better than others; why not pay them better? Whole system needs revamp. Your statement is complete subterfuge. The issue is poor entry level teacher pay, which leads to poor overall teacher pay. Your feelings about an MEA executive's pay, unions, and ideas on a race to the bottom approach for teacher pay are opinions. This discussion is about straight forward facts. Michigan and American teacher pay is unacceptably low. This must be corrected. Teachers are demonized by the right - part of a larger steategy to destroy public ed and replace it with for profit model. Bridge rates it half accurate? Whitmer’s campaign could not produce the plural teachers she talked about. I’d say that her statement is totally inaccurate. And as for the starting teachers with lots of kids, I’d say that is a choice. One usually equates starting with younger, and younger people usually do not have 5 kids. The sole bread winning teacher with 5 kids was probably the result of a career change, again a choice. And the husband not working in this age of excessive jobs relative to the workforce is hard to understand. Yes, some people make bad decisions, but those few are not a reason to cave to the MEA who if they had their way would be doubling teacher pay. It's not your job to police life choices. One can either be on food stamps as a teacher or you can't, and in Michigan you obviously can. If I am paying someone else's bills, it is absolutely my job to police or at least critique their life choices (just as I do with my children when they make poor decisions). Don't want me to tell you what you what you are doing wrong?, learn to support yourself. It is when the money is coming out of my pocket. Teacher pay should be doubled. There is no more important job to a civilized society. Starting teacher salaries in Michigan may be modest, but have you considered the amount of time off they get per year? Teachers are off for 2 months in the summer, 2 weeks in December, a week in the spring, plus get many other holidays off. If you also consider the pensions & benefits for retired teachers, that is worth A LOT, if they are actually able to collect it. Most jobs get maybe 2 weeks of vacation and some sick days. Most other jobs do not offer pensions. I certainly appreciate and respect our teachers, but many do go into that profession for the time off and benefits. Increasing all teacher salaries would be a huge cost. I think they should consider more modest pay raises for over time and look into offering teachers more practical support. Adjust school day hours so they start later (9-4ish) so kids/teens are more alert. Hire support staff that can assist teachers in class room, grade papers, do before/after school tutoring, etc. Allocate funds for supplies so teachers don't have to buy their own. Minimize after school teacher work to under 1 hour per day (computerized tests, less homework, etc). Your comment that most teachers go into the profession for days off and pensions is, to a large degree, false. An easy test of this is, are you a teacher? If you aren't, then why not? If you have identified, what sounds like, by your description, an excellent opportunity to work very limited hours with a very good pension, why have you not taken advantage of this opportunity? The answer is pretty clear, and negates your position. Not a good sign when a candidate for political office wants to base policy and talking points on what appear to be statistical outliers. Starting teacher salaries in Michigan may be modest, but have you considered the amount of time off they get per year? Teachers are off for 2 months in the summer, 2 weeks in December, a week in the spring, and several holidays. Plus pension/benefits retirees are worth A LOT. I certainly appreciate and respect our teachers, but many do go into that profession for the time off and benefits. Increasing all teacher salaries would be a huge cost. I think they should consider more modest pay raises for over time and look into offering teachers more practical support. Adjust school day hours so they start later (9-4ish) so kids/teens are more alert. Hire support staff that can assist teachers in class room, grade papers, do before/after school tutoring, etc. Allocate funds for supplies so teachers don't have to buy their own. Minimize after school teacher work to under 1 hour per day (computerized tests, less homework, etc). Poll teachers to see what support would be most beneficial to them. I suggest you try being a teacher with all that time off. In every vocation there are those that take advantage, but good teachers are doing the most difficult job in the universe - my assessment after post retirement teaching for six years from a forty year career in heavy manufacturing and logistics. I'm a licensed teacher in Michigan. While I am not on food stamps, I am eligible to do so. I live well below the poverty level. https://www.bls.gov/oes/current/oes_mi.htm#25-0000 There area number of teacher classifications that would be eligible for food stamps based upon eligibility requirements. Seems Ms. Whitmer's claim is more than half true. The link you posted doesn't support your claim at all! I'm surprised at how well teachers actually do according to this and way better than a lot of other occupations. Guess what Chuck, all most everyone thinks their job is hard and without the benefits that teachers get! People have a good idea of what an occupation involves before they purse it so neither envy nor sympathy should be offered. But he pity party that so many teacher wallow in and the Gretch encourages is nauseating. Actually, Gretchen was trying to make a point, maybe the food stamp illustration wasn't the best, because it's much more complex and is due to the attack on public school teachers that started in 2011. For a new teacher, the pay is disappointing, maybe not poverty, but there isn't much future in the profession as far as pay, compared to what it was before Snyder got in and teachers had salary steps that increased year after year, and there was a living wage to look forward to. The high salaries being reported are likely those of veteran teachers that are at Step 10, and they are the ones making the decent salaries. Also, critical shortage areas and special education teachers may be contract teachers. What is not getting out to the public and no candidate seems to effectively communicate is that teaching has become more or less a dead-end job that today's college student probably will not consider due to the fact that (under Snyder) in 2011 the first move he and the Republican Legislature made was to cancel out teacher Seniority as well as Teacher Tenure. Then, Snyder and Jase Bolger (remember him??) insisted the MPSERS pension plan wasn't feasible, so as of July 10, 2010, no new teachers could join the plan, instead having a choice of a defined contribution plan using only their money, no matching contribution, on a reduced salary of course. Furthermore, these guys interfered with teacher pay steps, a big no-no, and did their best to crush unions, specifically the Detroit Federation of Teachers. Then, two new companies sprung up that somehow a lot of teachers are hired by EduStaff and PESG out of Caledonia, Michigan, kind of a Kelly company for teachers, so they are not really working for the district, and all substitutes have to go through these two companies that, in essence, "steal" teacher monies to make their profit that could have gone into the MPSERS pension plan, so the assertion that MPSERS is not feasible was always a lie. Certified teachers and those "teachers" with only 90 credit hours are paid the same and lumped together. Benefits were cut to the bare bone. Not to mention the teacher evaluation scam whereby teachers are subject to the same type of evaluations as in the "private" or corporate sector -- well, teaching is an art, and no two teachers will approach it the same way. There was a time when teachers were being blamed for all of society's ills, well not any longer now that the Republicans have succeeded in ruining it as a career choice. And I won't even get into Betsy DeVos, but she will never be of any help to public education. Snyder and the Republican legislature oversaw this big scam, and it is probably the reason a lot of teacher programs are lacking students, or have been done away with (Madonna University). Who wants to spend all that money on an education and credentials to become certified when all you might ever be is a temp? If this is ranked as somewhat true, I am not sure you know how the truth works. And the point of rhetoric is to persuade. Whomever wrote this is ignorant of both how the truth works and what the word rhetoric means. And to blithley state that teaching is important. There is no profession more important to a civilized society. None. Let me guess ... you are a teacher? It is exactly this mindset feeding my job or any job is more important than your's that oozes from the modern left at exactly the same time that they claim to care and know best for the everyday down trodden masses. Nice touch! Someone tell me if your employer or even your union is notified if you have a bridge card? If they are, is it legal for them to release that information to the press? Maybe people on assistance are listed somewhere that Bridge would have access to? If none of this is true then I question how they can ascertain whether the claim is true or not? In that case a simple we don't know would be the more prudent verdict. You know there is a problem when a former student, now a college graduate, returns to visit her high school teacher four years after graduating from high school, and describes being hired, in the same community, as an engineer at a salary that is beyond the max pay on the school salary schedule even after 30 years of experience. This is exactly what you get with a government controlled, heavily unionized monopoly. Unhappy customers, unhappy workers, entrepreneurial approaches are stifled and we get a very expensive sub-par product. Good and great teachers should be paid more and allowed to experiment to make things better. Ineffective ones should be helped to a point and then helped to find more suitable employment if that fails. This will not happen in the context of our current system. The power and politics overwhelms the consumer and the people paying the bill. Tear it down and start over! We were just told at a meeting today that we were no longer allowed any "perks" from the district i.e. bottle of water on conference nights, bagel treat for an unexpected reason. The district needs to account for all the money spent and it can not be spent on teachers. Wow!